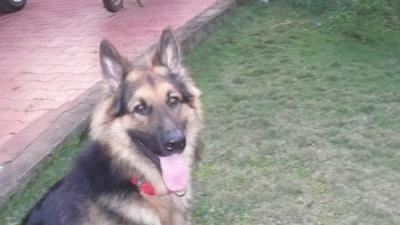 This is about our two and half year old GSD Casttello Ronaldo. Like the name he was a very good football player. Everyday he wanted us to play with him for at least half an hour, in the morning as well as in the evening. He was so nice to look at and like to remain always clean. We miss him too much and no words can explain our love towards him. Casttello had a fight with a cobra and died on 22nd Nov 2010. His greatest passion is to travel in our car. We are at peace because we have given him a royal life during his short interval with us. He never begged for food and even if he was inside near the dining table, he used to remain at a distance without disturbing us. He was someone with great self respect. We missed him very much.